As adults, we write for different purposes. There are practical reasons for writing, like jotting down a grocery list or directions to go somewhere. There are job-related reasons for writing, like sending out emails or writing memos and reports. There are social reasons for writing, like writing letters or cards to loved ones and friends. There are academic reasons for writing, like writing a research paper based on the reading of nonfiction text. And there are personal reasons for writing, like keeping a journal or a diary, or writing creative stories. Good writing is more than simply putting words down on paper. 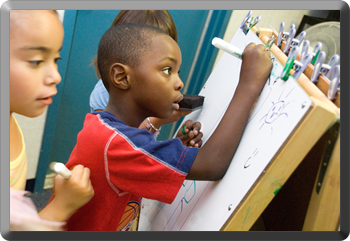 A child’s ability to form letters properly and use good penmanship eases some of the strain that writing can produce. Writing starts with clear thinking and enough time to organize thoughts into stories or coherent text. And it takes practice! 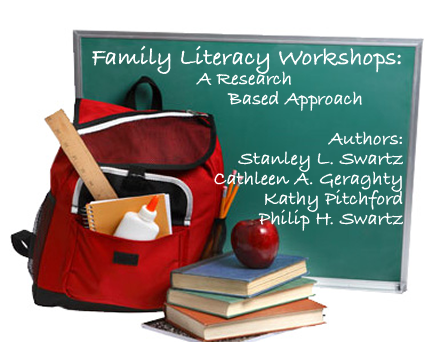 This workshop will help parents recognize stages of writing and different types of writing and will give them a handwriting model, which will help them support their child through the writing process. This activity will expose parents and children to different types of writing and give them a chance to explore writing for two different purposes. This activity addresses Writing Strategies, Writing Applications, and Listening and Speaking Strategies by helping children explore their creativity by using only a picture as a writing prompt. This activity addresses Writing Strategies, Writing Applications, Word Analysis, and Fluency and Systematic Vocabulary Development by using a familiar tune to write new lyrics. This activity addresses Word Analysis, and Fluency and Systematic Vocabulary Development by helping their child use descriptive vocabulary words that start with the first letters in their name. This activity addresses Word Analysis, Fluency and Systematic Vocabulary Development, and Written and Oral English Language Conventions by having children write short notes and messages to be deciphered by the reader.